More proof, if more was needed that the real reason for war was to destroy the threat of Hezbollah. That threat being that Hezbollah are capable of defending themselves and standing up to and discouraging Israeli aggression . A problem they believed was only going to get worse in the future. It was also probable that this was intended to be the beginning of a wider conflict with Israel/USA picking off weaker allies before commiting to an attack on Iran. This wider conflict is also still possible . Independence and the ability to defend themselves is no good reason for Israel to destroy Lebanon. A former top American diplomat says the US deliberately resisted calls for a immediate ceasefire during the conflict in Lebanon in the summer of 2006. Former ambassador to the UN John Bolton told the BBC that before any ceasefire Washington wanted Israel to eliminate Hezbollah’s military capability. Mr Bolton said an early ceasefire would have been “dangerous and misguided”. He said the US decided to join efforts to end the conflict only when it was clear Israel’s campaign wasn’t working. The former envoy, who stepped down in December 2006, was interviewed for a BBC radio documentary, The Summer War in Lebanon, to be broadcast in April. Mr Bolton said the US was deeply disappointed at Israel’s failure to remove the threat from Hezbollah and the subsequent lack of any attempt to disarm its forces. 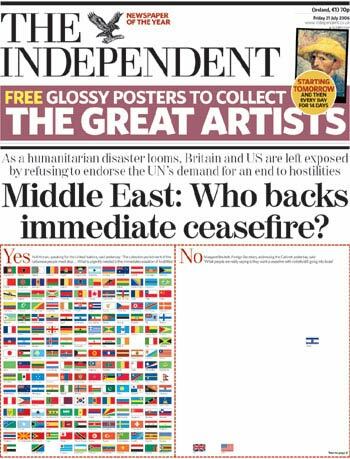 Britain joined the US in refusing to call for an immediate ceasefire. The war began when Hezbollah captured two Israeli soldiers, but it quickly escalated into a full-scale conflict. BBC diplomatic correspondent Bridget Kendall says the US-UK refusal to join calls for a ceasefire was one of the most controversial aspects of the diplomacy. At the time US officials argued a ceasefire was insufficient and agreement was needed to address the underlying tensions and balance of power in the region. 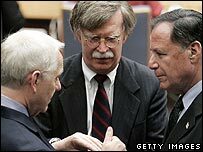 Mr Bolton now describes it as “perfectly legitimate… and good politics” for the Israelis to seek to defeat their enemy militarily, especially as Hezbollah had attacked Israel first and it was acting “in its own self-defence”. Mr Bolton, a controversial and blunt-speaking figure, said he was “damned proud of what we did” to prevent an early ceasefire. Also in the BBC programme, several key players claim that, privately, there were Arab leaders who also wanted Israel to destroy Hezbollah. “There were many not – how should I put it – resistant to the thought that the Israelis should thoroughly defeat Hezbollah, who… increasingly by Arab states were seen as an Iranian proxy,” said UN special envoy Terje Roed Larsen. More than 1,000 Lebanese civilians and an unknown number of Hezbollah fighters were killed in the conflict. 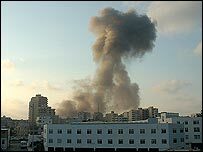 Israel lost 116 soldiers in the fighting, while 43 of its civilians were killed in Hezbollah rocket attacks.